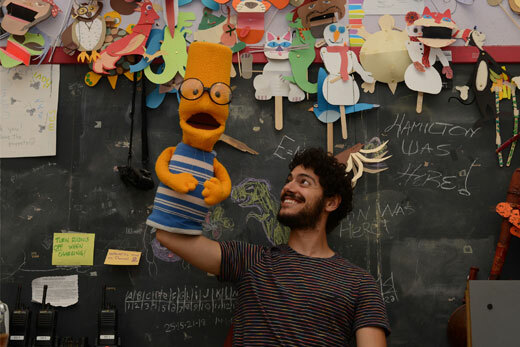 Emory College alum Jake Krakovsky's one-man show is now slated for performance at Atlanta's Woodruff Arts Center in 2015. Photo by Charlie Watts. Before Jake Krakovsky even graduated from college, he had one of those rare openings where years of work culminated in one special moment. It came as the play he wrote about the Holocaust premiered at Emory, while his grandfather, a Holocaust survivor, watched him perform. The theater studies major had honed his honors thesis into a comedy, based on Jewish folklore, about catastrophic tragedy. He hoped humor could help his generation grapple with the history it had inherited. Krakovsky's one-man show is now slated for performance at Atlanta's Woodruff Arts Center in 2015. "Theater invites you to empathize and open yourself up to something different than yourself," the 2014 alumnus says. "If we want to make the world a better place, empathy is about the best place to start." Krakovsky is starting his career with a clear understanding of how and why his work makes a difference. His experience touches on just a few of the many opportunities for engaged learning at Emory, which increasingly is combining co-curricular learning with academic coursework. Krakovsky wrote his play during a fellowship with the Fox Center for Humanistic Inquiry. He studied theater in Italy for a semester, and he received two arts-related internships with the Ethics and Servant Leadership (EASL) program, which combines service hours and classroom instruction.